prominent in the cities like Rajkot, Jamnagar, Junagadh, Bhavnagar, Surendranagar and Porbandar. The food here is spicy and oily and they use a lot of garlic and red chilly. I remember eating this Dhokli nu Shaak on one of my trips to Rajkot,some 20 years back. I remember falling I love with this dish and cooking it too then but that was it I I did not cooked this dish in years , it is only while searching recipes for our April Marathon i recollected this dish. I learnt the dish from a friend and after that could suggest it to Valli for our ICC. Hope you guys enjoy this dish. Mix everything and blend to a smooth consistency. Place it in a pan and start cooking on slow heat stirring constantly. Increase the heat and cook till a lump is formed. Pour into a greased tray. Take a spoon full from the batter and spread on a surface, it should come out easily after cooling. Add tempering ingredients in the order mentioned. Let the water cook and the flavors infuse . Add the sour buttermilk and dhokli squares. Let cook for another 5-7 minutes. 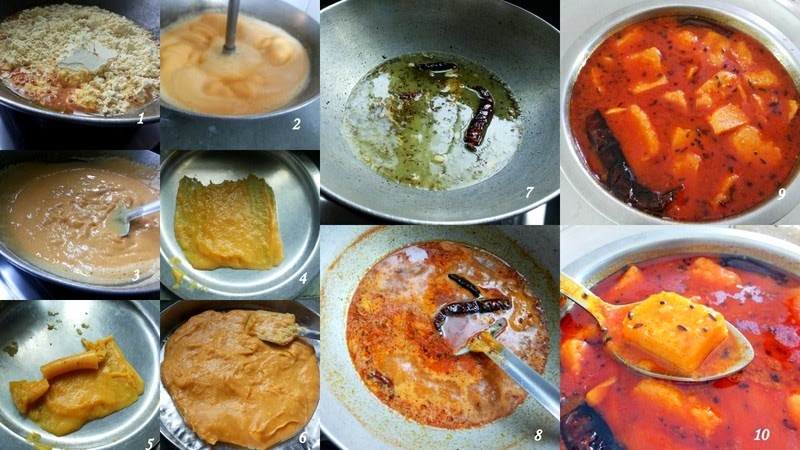 The consistency of the gravy is medium, the dhokli absorbs the gravy after cooling so normally it is served right away. 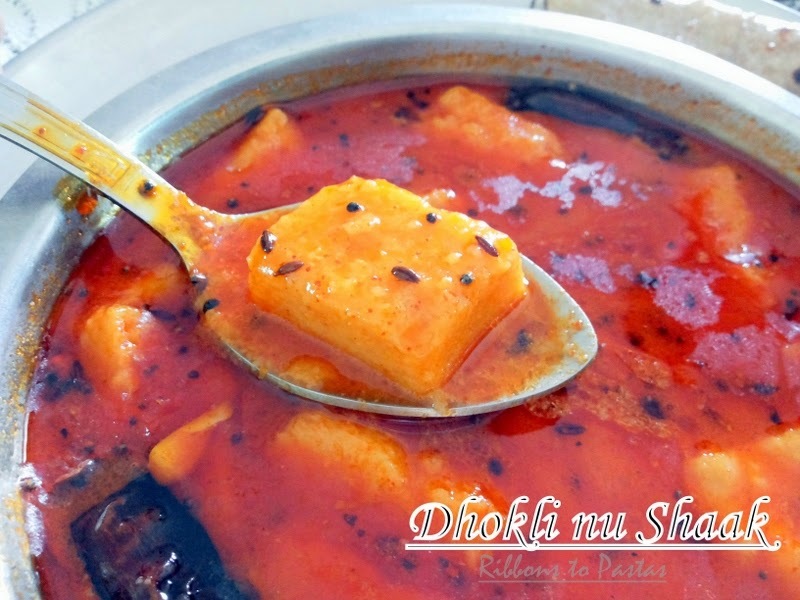 Both , the dhokli and the gravy can be made in advance and mixed at the time of serving. Garlic is optional, most people do not use it. For Dhokli some people use buttermilk instead of water , I have used water. 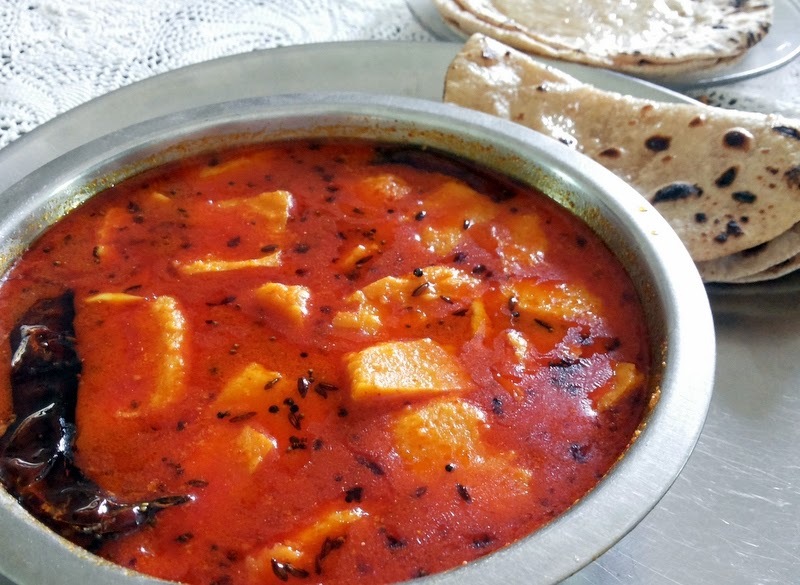 Gujrati family's always use a little extra oil in this curry, you could cut it down but since there is no oil in dhokli it can be made into a low cal version, though The taste of this oily version. Is mind blowing. Best served with roti / rotlas.